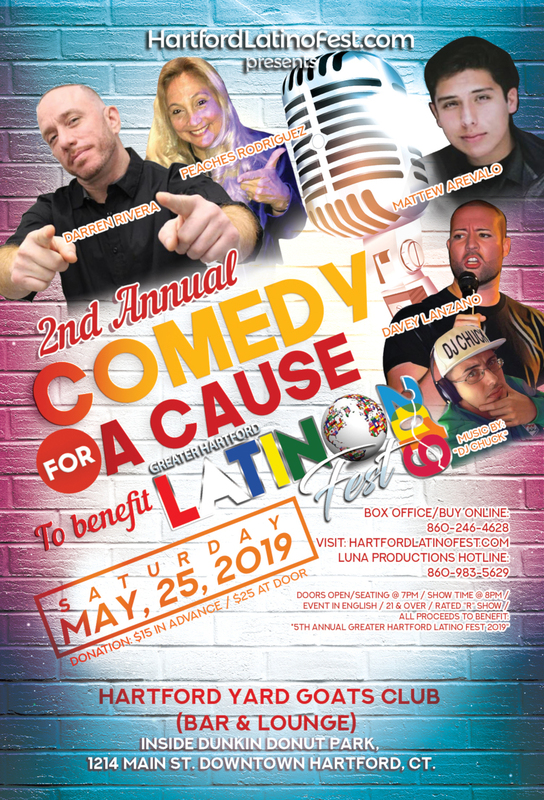 Hartford Latino Fest > Events > Yard Goats Club Bar & Lounge > 2nd Annual Comedy for a Cause at the Hartford Yard Goats! 2nd Annual Comedy for a Cause at the Hartford Yard Goats! 1214 Main St. Downtown Hartford, CT.
1) New & Upcoming, young “MATTHEW AREVALO” out of NYC! 3) “DARREN RIVERA” (One of the Original Latino Kings of Comedy) and to much to mention here! APOLLO Theater Greatest! You must look her up, at all your social media’s! For tickets call Vic Luna at 860-983-5629 – Hurry limited seating/tickets! Ask about our Group Rates. Register for Event: 2nd Annual Comedy for a Cause at the Hartford Yard Goats! GREATER HARTFORD LATINO FEST, HARTFORD, CT - SAT., JUNE 22, 2019. Your ticket for the: 2nd Annual Comedy for a Cause at the Hartford Yard Goats!